1.1 CIVICUS is a global alliance of civil society organisations (CSOs) and activists dedicated to strengthening citizen action and civil society around the world. Founded in 1993, CIVICUS has members in more than 170 countries. 1.2 The Gulf Centre for Human Rights (GCHR) is an independent, non-profit CSO founded in April 2011. GCHR provides support and protection to human rights defenders (HRDs) in the Gulf region and neighbouring countries to promote human rights, including the freedoms of association, peaceful assembly and expression. 1.3 In this document, CIVICUS and GCHR examine the Government of Qatar’s compliance with its international human rights obligations to create and maintain a safe and enabling environment for civil society. Specifically, we analyse Qatar’s fulfilment of the rights to the freedoms of association, peaceful assembly and expression, and unwarranted restrictions on HRDs, since its previous UPR examination. To this end, we assess Qatar’s implementation of recommendations received during the 2nd UPR cycle relating to these issues and provide follow-up recommendations. 1.4 During the 2nd UPR cycle in 2014, the Government of Qatar received 31 recommendations relating to the space for civil society (civic space), including recommendations to ratify international human rights protocols. Of these recommendations, 24 were accepted and seven were noted, including to “release all prisoners of conscience, including the poet Mohamed Al-Ajami, and to respect the rights of all individuals to freedom of expression.” An evaluation of a range of legal sources and human rights documentation addressed in subsequent sections of this submission demonstrate that the Government of Qatar has not implemented 13 recommendations relating to civic space, and has partially implemented one. While the government has made significant strides in signing international human rights treaties, such as those related to civil, political, economic, social and cultural rights, these have been done with reservations that limit the application of these. Further, Qatar has persistently failed to address unwarranted restrictions of civic space since its last UPR examination and acute implementation gaps were found with regard to the rights to the freedoms of peaceful assembly and expression, and the treatment of HRDs. 1.5 CIVICUS and GCHR welcome Qatar’s decision to accede to two core UN human rights treaties, the International Covenant on Civil and Political Rights (ICCPR) and the International Covenant on Economic, Social and Cultural Rights, despite formal reservations depriving women and migrant workers of protection under the treaties. Further, it is recognised that since 2017 Qatar has begun a process of addressing a number of unwarrantedly restrictive laws, such as those relating to labour standards for migrant workers, as well as instituting a minimum wage within its revised Law No. 15 on service workers in the home (the Domestic Workers Law). 1.6 However, CIVICUS and GCHR are deeply concerned by continued restrictions facing HRDs, including a travel ban on human rights lawyer Dr Najeeb Al-Nuaimi. There are also concerns surrounding the continued hurdles put in place for CSOs to register under Law No. 12 of 2004, which gives the Minister of Civil Service Affairs and Housing undue powers to dissolve associations. CIVICUS and GCHR note with concern the absence of any independent media outlets in Qatar and the continued restrictions faced by local and foreign journalists seeking to work in Qatar. 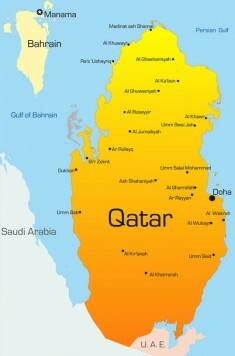 1.7 As a result of these concerns, civic space in Qatar is currently rated as 'repressed' by the CIVICUS Monitor, indicating the existence of heavy constraints on civil society’s fundamental rights. Section 2 of this submission examines Qatar’s implementation of UPR recommendations and compliance with international human rights standards concerning the freedom of association. Section 3 examines Qatar’s implementation of UPR recommendations and compliance with international human rights standards relating to the protection of HRDs, civil society activists and journalists. Section 4 examines Qatar’s implementation of UPR recommendations and compliance with international human rights standards concerning the freedom of expression, independence of the media and access to information. Section 5 examines Qatar’s implementation of UPR recommendations and compliance with international human rights standards relating to the freedom of peaceful assembly. Section 6 makes recommendations to address the concerns listed. An annex lists the implementation of recommendations received by Qatar in the 2nd UPR cycle that are referenced in this submission.